A Lionel Messi masterclass, netting a brilliant free kick before laying on two more goals, put Argentina's World Cup qualifying campaign back on track with a resounding 3-0 win over Colombia in San Juan on Tuesday. 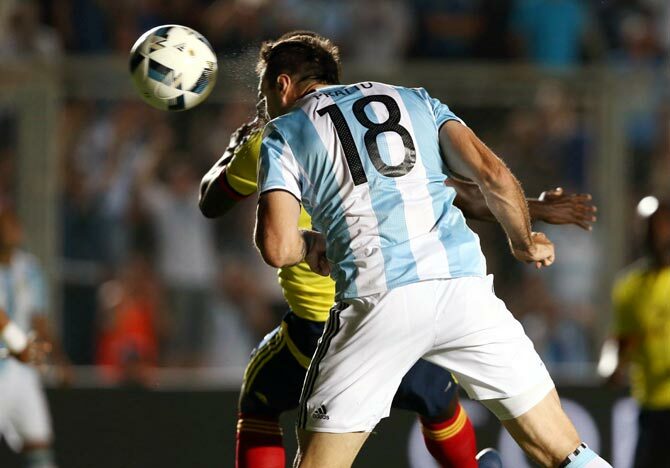 The win lifted Messi's team, recovering from two successive defeats, into fifth place in the South American group with 19 points, one behind Ecuador and Chile, who beat Uruguay 3-1 with an Alexis Sanchez brace. Brazil top the table with 24 points while Uruguay are second with 23. Colombia dropped to sixth on 18 points. 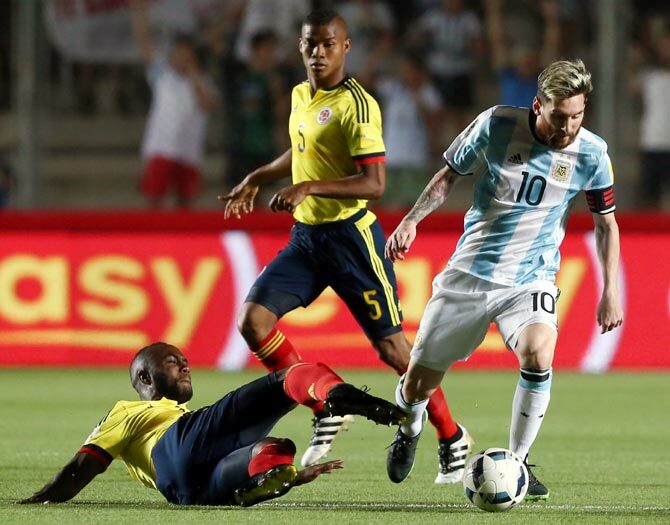 "It's hard to analyse (the match) when you concede those kinds of goals and the more so when one team has a player like Messi," said Colombia coach Jose Pekerman. "With the second goal, the match became practically impossible (for us). You try to get goals back but we couldn't and Messi made the difference." 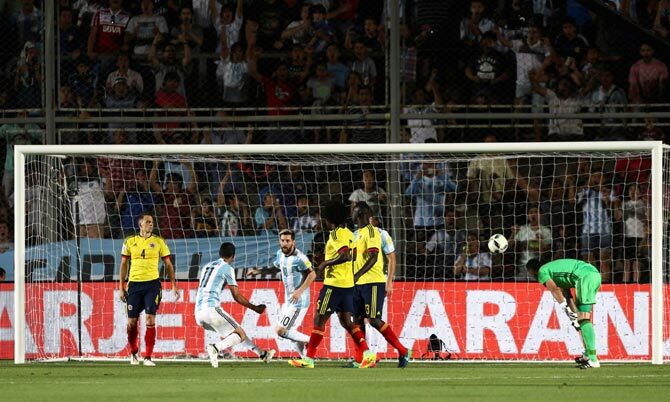 Argentina took a ninth-minute lead when Messi curled his free kick over the wall and into the top left corner of David Ospina's net off the underside of the bar for his 57th Argentina goal. Falcao came close for Colombia at the other end when he headed James Rodriguez's free kick just over Sergio Romero's bar after 18 minutes. Five minutes later Messi's superb ball over the defence was met on the edge of the six-yard box with a firm header into the bottom far corner by Lucas Pratto, justifying his inclusion in place of the benched Gonzalo Higuain. 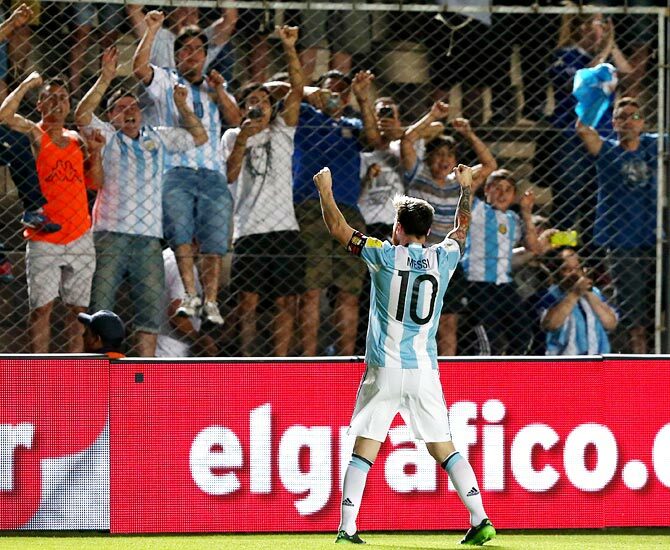 Di Maria did, however, break a goal drought for his country stretching back eight matches, in the 83rd minute. Messi cheekily stole the ball from a defender, raced into the box and laid the ball square where Di Maria blasted his 18th Argentina goal into the roof of the net. Rodriguez hit the post with a free kick in stoppage time with Colombia's last chance of the match. Bolivia, who had Gabriel Valverde sent off after an hour for a second booking, beat Paraguay 1-0 at home in La Paz thanks to an own goal by Gustavo Gomez. A second successive defeat pinned Paraguay back in seventh with 15 points.